​​​​TEXAS - Texas added 21,400 non-farm jobs in August, but the state’s unemployment rate increased slightly from 4.6 percent in July to 4.7 percent, according to a Texas Workforce Commission (TWC) news release issued Sept. 16, 2016. 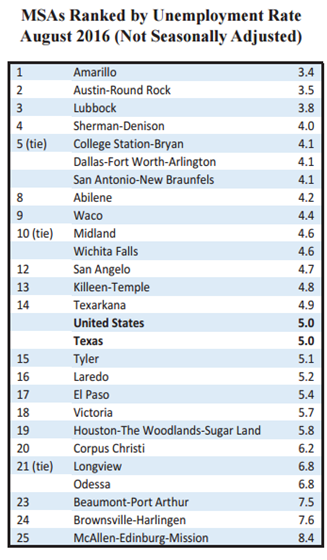 “Texas employers added 190,600 jobs over the past year, with the diversity of our economy highlighted by nine out of 11 industries [TWC tracks] adding jobs,” TWC Chairman Andres Alcantar said in a news release. Trade, transportation and utilities, another category tracked by the TWC, added the second-most jobs in August, with 4,000 new positions created. For the second consecutive month, construction employment grew, adding 1,300 new jobs. The Amarillo Metropolitan Statistical Area, or MSA, posted an unemployment rate of 3.4 percent in August, giving it the lowest rate in the state. The state’s 4.7 percent unemployment rate for August is below the national unemployment rate of 4.9 percent. ​Want to see the latest economic and employment stats on your area? Check out Market Research!